Ireland were well-beaten in their opening Six Nations encounter at Energia Park where a newly-professional England team ran out convincing 51-7 bonus point winners - England's biggest win over the Irish for 17 years. The hosts started well, but once chances opened up for England they were simply too clinical, with Simon Middleton having the luxury of hauling off key players before the hour mark to prepare for France next weekend. England will be pleased with the scoreline but concerned at how Ireland managed to get the upper hand at the scrum, an area of genuine French strength, and while England's two young props Sarah Bern and Hannah Botterman were outstanding in the loose, they are still learning their trade in the tight at this level. Some 4,637 spectators, a record Donnybrook crowd for a standalone women’s fixture, turned out in the cold for this game, played at the ridiculous time of 5pm on a Friday to suit broadcast schedules . 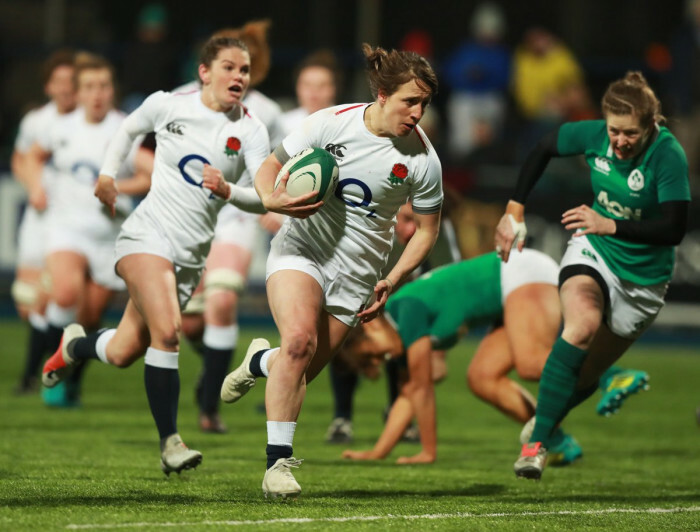 Ireland raced into the game with centre Michelle Claffey seeming to find space at ease through England's midfield, but Ireland failed to capitalise on a raft of early chances and England sat back patiently and soaked up the pressure. With the home defence stretched, Daley-Mclean’s expertly-weighted grubber kick was just grounded by McKenna, though Ireland were right to be aggrieved that the video referee wasn't consulted. That handed England a 13-0 halftime lead but the visitors were superb in the second half, putting the game well beyond doubt early on. Ireland had a chance through a Leah Lyons intercept, but a careless piece of play in the 22, leaked a soft try within a minute of the restart, with Bern popping up on Poppy Cleall’s shoulder to crash over beside the posts. Daley-Mclean converted and also added the extras to Lark Davies’ 46th-minute maul effort as England went up through the gears. Now starved of possession and territory, Ireland continued to dig deep with McDermott stealing a lineout and Juliet Short leading an important counter ruck. However, England’s strength in depth was really showing and Rowena Burnfield popped the ball out of a tackle for Daley-Mclean to weave her way over for a deserved close-range try, which she converted herself. Ireland skipper Ciara Griffin rallied her troops, the pack taking the game to England again via a series of penalties and lineout opportunities with Molloy tidying up a couple of throws. Anna Caplice, in particular, made a big physical impact off the bench with Lyons’ move to tighthead seeing Ireland dominate two five-metre scrums with the collapse resulting in the penalty try. Both coaches used their replacements wisely, with an eye on next week’s second round ties, and the fresh-legged Zoe Harrison was up in support to scamper over for England’s sixth try with a quarter-of-an-hour remaining. There was a big roar to welcome back experienced winger Miller from her long-term ankle injury and she raised the decibel level again with a cracking tackle on Amy Cokayne. However, England’s speed and sharpness saw them tally up eight tries in the end, with Tatyana Heard drawing in Emma Hooban to release Scott to score near the left corner, while Cleall burrowed over in the final minute despite Caplice going close to winning a relieving penalty. England coach Simon Middleton said: "There is a lot to work on especially with our execution, but both defensively and offensively we delivered some of the things we've been working in training on so I’m really pleased with that. Ireland: Lauren Delany (Firwood Waterloo Ladies/IQ Rugby); Eimear Considine (UL Bohemians/Munster), Sene Naoupu (Old Belvedere/Leinster), Michelle Claffey (Blackrock/Leinster), Megan Williams (Old Belvedere/Leinster); Nicole Fowley (Galwegians/Connacht), Ailsa Hughes (Railway Union/Leinster); Laura Feely (Galwegians/Connacht), Leah Lyons (Harlequins), Fiona Reidy (UL Bohemians/Munster), Aoife McDermott (Railway Union/Leinster), Nichola Fryday (Galwegians/Connacht), Juliet Short (Railway Union/Leinster), Claire Molloy (Wasps), Ciara Griffin (UL Bohemians/Munster) (capt). Replacements used: Emma Hooban (St. Mary's/Leinster) for Reidy (50 mins), Anna Caplice (Richmond) for Short, Ellen Murphy (Old Belvedere/Leinster) for Fowley (both 54), Alison Miller (Old Belvedere/Connacht) for Delany, Claire McLaughlin (Old Belvedere/Ulster) for Griffin (both 63), Anne-Marie O'Hora (Galwegians/Connacht) for Lyons, Kathryn Dane (Old Belvedere/Ulster) for Hughes, Linda Djougang (Old Belvedere/Leinster) for Feely (all 72). England: Sarah McKenna (Saracens); Jess Breach (Harlequins), Emily Scarratt (Loughborough Lightning), Tatyana Heard (Gloucester-Hartpury), Kelly Smith (Gloucester-Hartpury); Katy Daley-Mclean (Loughborough Lightning), Leanne Riley (Harlequins); Hannah Botterman (Saracens), Lark Davies (Worcester Valkyries), Sarah Bern (Bristol Bears), Catherine O'Donnell (Loughborough Lightning), Poppy Cleall (Saracens), Sarah Beckett (Firwood Waterloo Ladies), Marlie Packer (Saracens), Sarah Hunter (Loughborough Lightning) (capt). Replacements used: Amy Cokayne (Wasps) for Packer (34 mins), Rowena Burnfield (Richmond) for Cleall, Shaunagh Brown (Harlequins) for Bern (both 48), Bryony Cleall (Saracens) for Botterman (55), Zoe Harrison (Saracens) for Scarratt (58), Emily Scott (Harlequins) for Smith, Natasha Hunt (Gloucester-Hartpury) for Riley (both 63), Rosie Galligan (Saracens) for Hunter (68).